Delivering a new helicopter maintenance hangar at Naval Air Station North Island overcame numerous design and schedule challenges in addition to the project being selected to test the Early Contractor Involvement acquisition strategy. At Naval Air Station North Island, Calif., near the end of a long first day in a weeklong programming and design charrette, the design team prepared for its last appointment. The public works officer was to give his vision for the new, three squadron MH-60 Helicopter Maintenance Hangar. He spoke to the rich and storied heritage of the installation and its visual relationship with the City of San Diego. With inward views from San Diego Bay, yacht clubs and San Diego International Airport, this new hangar had to be worthy of its location. It was to be a significant part of the base’s image and a source of Navy Pride. It had to be functional, efficient, and durable, achieve LEED Silver and be completed within budget. 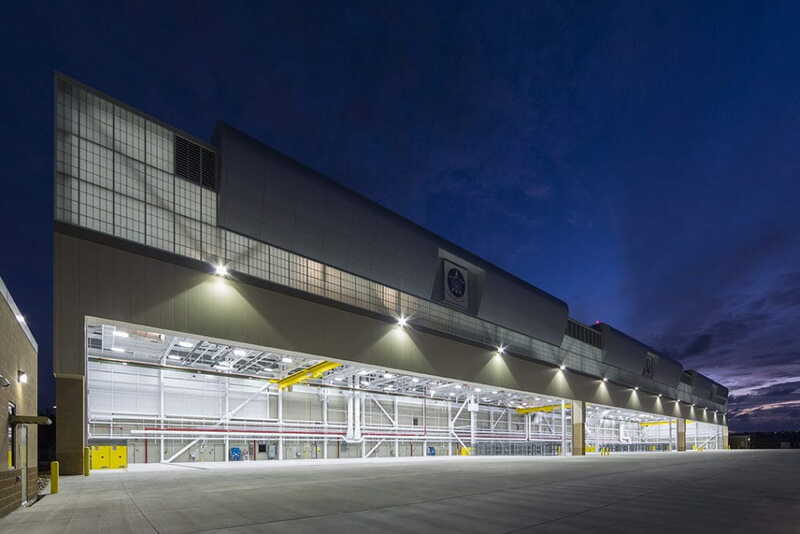 Moreover, Naval Facilities Engineering Command (NAVFAC) had selected the hangar to test the Early Contractor Involvement (ECI) delivery method. The challenges, some known that first day and others that emerged throughout the process, would prove to be significant. Ultimately, however, teamwork and ingenuity delivered a successful outcome, achieving the project’s many goals, including elevated sustainability ratings introduced midway through—all despite operating in this “new normal” fiscal environment. NAVFAC began soliciting for an ECI contractor to come on board at the midpoint of the design phase and Architect and Engineer of Record Frankfurt-Short- Bruza (FSB) set to work incorporating the expressed needs of all stakeholders. The project, in addition to aesthetic challenges, met significant budget obstacles early on in design. The site was located on a thick layer of sand over another thick layer of bay deposits. It was determined to be liquefiable during a seismic event. The squadrons also needed previously unaccounted for space to properly function. As the concept design moved into design development, these and other challenges were resolved through innovative team solutions. To mitigate the soil issues, engineers determined that stone columns offered both overall site improvement and higher facility performance, with a reduced cost over a traditional driven pile solution. They also utilized buckling restrained braces to reduce the effect of seismic events and temperature change on the structure. The net project savings more than paid for the upfront increased cost. Architects worked with engineers and installation maintenance personnel to design equip- ment platforms in the high bay space. This opened up the additional floor space each squadron needed. Outdoor spaces were created on both levels to provide open air seating areas and break spaces, again freeing up needed space in the facility. Flightline view of the new MH-60 Helicopter Maintenance Hangar at Naval Air Station North Island, Calif. The facility, completed on time in December 2013, was designed to be a significant part of the installation’s image and a source of Navy Pride. Considerable time was spent on facility aesthetics. Architects wanted to control the visual scale of this large facility, disguise its industrial nature and provide strong features. Most prominent are the naval aviation-themed entry elements that create both a material and spatial hierarchy, and clearly delineate the land-side points-of- entry. The massing of the facility on the land-side was broken up to create a softer rhythm across its 640-ft front face, creating space for more operable windows, daylight and outdoor areas. The air-side of the facility presented a separate set of aesthetic challenges. Architects developed a curved roof profile to sculpt the high bay’s boxy volume and visually transition to the lower administration and shop space. A second curved feature added over each squadron’s hangar doors rolled back up over the roof to resemble stacked waves. These features contained a recessed backlit squadron insignia and served to break up the massive volume of the hangar bay. Translucent insulated panels in the vertical zone of the trusses make the roof appear thin, and at night, give the appearance it is hovering over the lower walls. During the day, the translucent panels permit significant diffuse daylight into the hangar bay and daylight sensors regulate light fixtures. Vertical lifting fabric doors were selected to eliminate the area required for door pockets, and columns between squadrons were minimized to create the effect of one continuous opening. Through team collaboration, innovative solutions and identification of bid options, the project team delivered a design development submission that was tracking on budget and on time. It was at this 60 percent design level when a newly adopted Navy policy increased the requirement from LEED Silver to Gold. Additionally, the project site was increased by approximately half and the construction budget was cut 2 percent. NAVFAC’s Design Manager also lost much of his supporting professional staff and the team learned the ECI contractor could not be added to the team until the pre-final design submission. In response, the entire design team reviewed cost estimates and created prioritized lists aimed at minimizing the impact of these new challenges. The User Group representative coordinated with his aviators and made timely decisions. Public Works took on the demolition of several existing buildings on the expanded site and the NAVFAC Design Manager covered the gap left by his loss in support staff while maintaining his role as the Navy’s design lead. The change to LEED Gold required an additional 10 points. As LEED is very regimented in its precise execution, it is not perfectly suited to all projects. For example, enhanced commissioning by a third party and brownfield redevelopment were already part of the project, but they could not contribute points because they could not be executed in the manner required by the rating system. This necessitated that other potential credits be developed and prioritized based upon estimated cost. At the pre-final design phase, the ECI contractor, Hensel Phelps, joined the team. They were already familiar with the base and their impact was immediate. Contractually speaking, this was no longer an ECI project. But the team embraced the collaborative spirit of ECI delivery and worked to blend the final design and early site package. And since all bid options were strongly desired by the project stakeholders, the ECI contractor was encouraged to come up with cost saving and quality improving proposals. To increase creativity, the contractor’s proposed recommendations were not required to comply with federal design standards. The notion being, if a proposal had merit, it would be considered. Over a four-month period, the design team considered 58 separate value management proposals—from $900,000 credits to $300,000 additions. FSB performed technical reviews and made recommendations. One particular point of interest was that even with the facility’s amplified aesthetic nature, it was predominately the expanded site that pushed budget limitations when compared by line item to the project’s DD Form 1391. Even so, a significant portion of the value management proposals focused on the aesthetics. These design elements were not the reason the budget was being pushed, they were just the most visible. Staying focused on the charge to be creative and reflect a sense of pride in naval traditions and naval aviation, the team delivered final contract documents with all bid options and stakeholder input incorporated, as well as the aesthetic elements intact, with only a 1 percent growth from the original construction estimate. The ECI-type collaboration effectively served to transfer design intent from FSB to the contractor and to clarify subcontractor questions as bids were finalized. The results speak for themselves. Total change orders subsequent to the final contract documents were well below 3 percent, the majority of which were field requested design changes or unforeseen conditions. The facility was completed on time, in December 2013, and it will benefit mission accomplishment, improve readiness and enhance occupant performance for years to come.